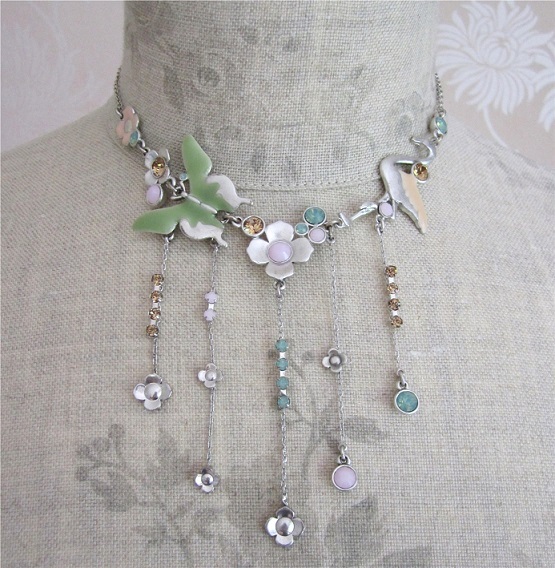 A really pretty pink flamingo, green butterfly and flower cascade necklace. It comprises a row of motifs: enamelled butterfly (3 cm/30 mm); various plain metal and enamelled flowers (1 cm/10 mm - 1.5 cm/15 mm); flamingo (4 cm/40 mm); and various cup set Swarovski crystals in opal green, opal pink and light topaz brown. The necklace measures 14 inches/36 cm to an adjustable 17 inches/44 cm. Silver plated with a slightly patinated finish. Beautiful pastel colours: shades of green, shades of pink and light topaz browns. Pilgrim impressed in to the back of the flamingo and the butterfly. The extension chain is embellished with the Pilgrim logo charm.